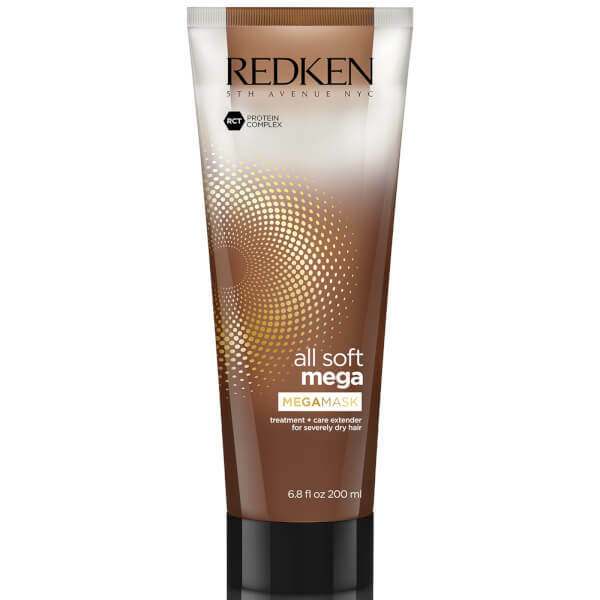 Catering specifically for severely dry, coarse hair, the Redken All Soft Mega Mask combines the deep conditioning of a mask with the lasting benefits of a care extender. Powered by the brand's exclusive RCT Protein Complex, the replenishing, rinse-out treatment delivers optimum levels of moisture and hydration, whilst Cactus Extract, Aloe Vera and Sacha Inchi Oil nourish and strengthen hair from root to tip. 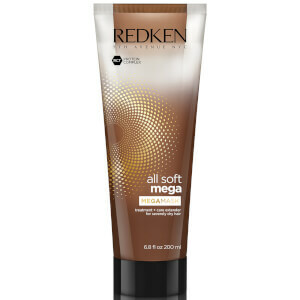 Expect a soft, sleek finish that lasts through three washes. After conditioning, apply to clean towel-dried hair. Rinse. Style as usual. In case of contact with eyes, rinse them immediately. Outer Tube: Aqua/Water, Cetearyl Alcohol, Aminopropyl Triethoxysilane, Paraffinum Liquidum/Mineral Oil, Lactic Acid, Dipalmitoylethyl Hydroxyethylmonium Methosulfate, Cetyl Esters, Cetrimonium Chloride, Citric Acid, Polyquaternium-6, Phenoxyethanol, 2-Oleamido-1,3-Octadecanediol, Parfum/ Fragrance, Chlorhexidine Digluconate, Arginine, Hydrolyzed Soy Protein, Sodium Cocoyl Amino Acids, Hydrolyzed Vegetable Protein Pg-Propyl Silanetriol, Potassium Dimethicone Peg-7 Panthenyl Phosphate, Sodium Sarcosinate, Propylene Glycol, Sodium Chloride, Potassium Sorbate, Tetrasodium Edta. Inner Tube: Aqua/Water, Cetearyl Alcohol, Behentrimonium Chloride, Amodimethicone, Glycerin, Octyldodecanol, Isopropyl Alcohol, Phenoxyethanol, Parfum / Fragrance, Benzoic Acid, Trideceth-6, Plukenetia Volubilis Seed Oil, Sodium Cocoyl Amino Acids, Cetrimonium Chloride, Potassium Dimethicone Peg-7 Panthenyl Phosphate, Caramel, Sodium Sarcosinate, Citric Acid, Propylene Glycol, Benzyl Alcohol, Coumarin, Linalool, Benzyl Benzoate, Aloe Barbadensis Leaf Juice Powder, Arginine, Hydrolyzed Soy Protein, Hexyl Cinnamal, Limonene, Hydrolyzed Vegetable Protein Pg-Propyl Silanetriol, Cereus Grandiflorus Flower Extract / Cactus Flower Extract, Glucose, Sodium Chloride, Sodium Benzoate, Lactic Acid, Potassium Sorbate, Tocopherol, Tetrasodium Edta.